The Liberals have been down in most polls since the SNC-Lavalin scandal, but it won't last—as I always try to remind everyone that Canada is an inherently liberal country. It's not easy for conservatives to win elections in Canada as conservatives. 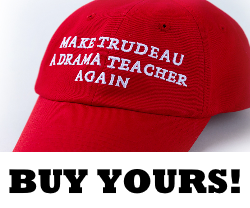 It's wishful thinking to believe that a scandal of such magnitude would make beating the Liberals easy for any party, even the NDP. It'll take a whole lot more than interference in a criminal case to take the Liberals down. It took Stephen Harper several tries to beat the Liberals after Adscam, so this go-around won't be any easier for the Conservative Party. 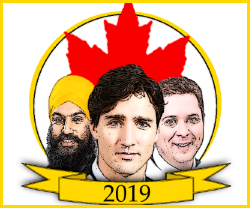 However, the possibility of reducing the Trudeau government to a minority is very high and it could pave the way for an eventual repeat of 2006. Despite what all of the professional, media-loved political prophets like Eric Grenier have been saying, my prediction is a lot different. 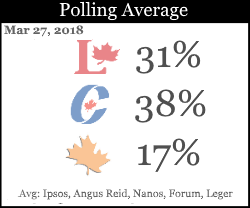 In the height of the Lavscam scandal, Grenier predicted a Conservative minority in his CBC poll tracker. Every political advisor will tell you to “get out there and knock on as many doors as you can!”. At a glance, it makes sense. You’re getting out there and making face-to-face contact with voters. This gives them a chance to make a quick first impression and if you meet them and your competitors don’t, then presumably that voter will think to themselves, “This candidate made the effort to meet me and the others didn’t, so I’ll vote for the effort-making candidate.” It’s reasonable to draw this conclusion, but seriously… that’s a pretty low-end means of assessing a potential candidate. What can you really learn about someone in a 30 second doorstep pitch? Enough to make a general impression and listen to their priorities, but so what? Why are we doing politics the same way that cheesy salesmen try to sell you sprinkler systems or vacuum cleaners? I finally finished Jordan Peterson’s 12 Rules for Life: An Antidote to Chaos. I’ve been meaning to read it sooner, but for a brief time I had had enough of Peterson and felt I had nothing more to learn by reading his book. Some time passed and then it miraculously appeared on the library shelf as a New and Notable 3-week loaner… so I decided to jump into the Peterson hurricane once more. It was worth it. Peterson does a great job diving deep into all sorts of subjects that he’s touched upon before, but the structure of the book and the uninterrupted narrative helped to contextualize and expand many of his ideas that have been presented in other formats previously. Peterson has taken criticism for offering “trite” advice such as, “Clean your room!” and “Pet a cat!” Many online Alt-Righters have mocked such expressions by appropriating Peterson’s voice and responding with things like, “Remember to wash your balls, Bucko!” The advice proves to be not trite, but essential. Modern feminism teaches women to pass the blame for their hardships to a wider, systemic problem that exists outside of their reach. It teaches women to be victims rather than fighters. This regressive ideology is spreading to the general population like a parasite, convincing young women and teens that men and their patriarchy must be knocked down and that equal opportunities must be replaced by equal outcomes. Modern women are being taught to ask the government to help them get ahead by implementing gender quotas and by fixing the wage gap. Women are being taught to elect bureaucrats who promise to make their lives easier. Unfortunately, most of these bureaucrats are men and the causes of classical feminism are being walked back by the ambitions of modern feminists. Classical feminism taught women to play by man's rules and to beat men at their own game. Modern feminism teaches women to embrace victimhood and to elect male politicians who will change the rules for them.